Scroll down to read the wonderful messages. Pass this on to a friend! Thank you for this lovely tribute. It helps to deal with this day and to help us move on. time.. I'm from Waco Texas... I was watching that morning when the plane crashed into the wtc and i was so much in shock. At first i couldn't believe it.. So i called my friend in Houston and she said the same thing. I just wanted to let u know that I really enjoyed your site it made me cry which gave me a little relief.. I didn't know anyone in the wtc, although i had a friend from Dallas that was there the day before.. I can only imagine how the people feel in that area and so many people lost there lives that day.. I myself am still trying to cope with it.. I hope and pray with each and every day for the families, and everyone that helped with the wtc and pentagon.. My thought's are with ya'll and everyone!! Thank you for the Wonderful Tribute. My wife and I are Emt's in New Jersey and we went to NY that day with our Ambulance Squad. They Stationed us at the New York Water Way in Weehawken, NJ where they were bringing people over by ferry. Those people were the lucky ones being treated for mostly Smoke Inhalation. They would not let any of us in near ground Zero. On the other side of the river there were over 1,000 Fire, Police and Emt's just sitting on there Gear along West Side Highway because of it being too Dangerous to be near the tower site. That is a Day We will never forget in our life time. I ordered the cd and still every time I play it (at least 6 times a day) it brings tears to my eyes, as I think about the friends and families who lost a loved one on that memorable day. May God wrap his arms of comfort around these people and may they find comfort in His embrace. This is part of God's bigger plan; what an honor that He chose your loved one for the mission. I hope this may offer some comfort to those who lost someone that day. May God continue to comfort you in those times of sorrow and know that there are others out here continuing to lift you and your families up in prayer. May God Bless you and you find comfort in his blessings. This tribute really touched us, my husband serves in the Air Force and it really hit home when that happened. We never know what life holds for us each day. We never know when we will say our last goodbyes to our loved ones. Life is truly precious, live each day to the fullest. It really makes you appreciate all the people who are police officers, fireman, EMT'S, and all those who serve in our military,. Thank you to all of you and we are sorry for all those who lost a loved one. Everyone of them is a hero because they taught us how to love more deeply, give more of ourselves and to stand united as one country. Every time I listen to this song, I become very emotional and teary eyed. I worked on Wall Street as a trader in 1969 as the Towers were being constructed. My husband was an officer in the U.S. Army for 26 years and we knew several people who were in the Pentagon when it was stuck. So many people perished on September 11th. So many individuals gave their lives to save others! But let us not forget the men and women who gave their lives during the World War I, World War II, the Korean War but most of all "The Viet Nam War!" The men and women who gave their lives during that war were never hailed as "Heros!" They were spat upon and were not supported by their fellow countrymen. They went to Viet Nam to protect all Americans. I pray for ALL men and women who gave their lives to protect our freedom and "mourn and weep" for the innocent people who were trapped on that fateful day in September.... May God keep all those who still mourn for their loved ones in "the Palm of His Hand" until they are able to stop hurting emotionally... May God Bless each one of you. I watched with horror and distain at the truly shocking events of that sad day in September 2001 on TV back here in the UK. 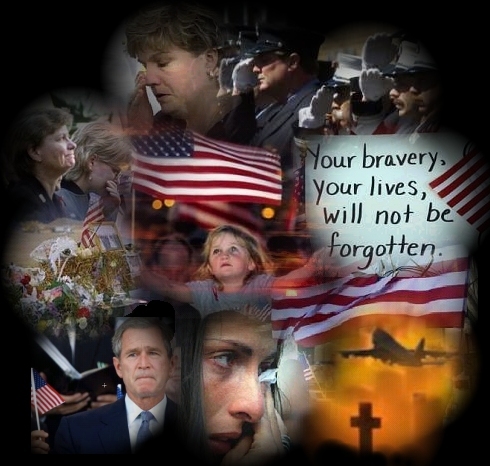 Every one of those who lost their lives were not just American heroes, but World heroes. The song is so beautiful and touches even the hardest heart strings. Thank you for allowing us the privilege of seeing and hearing your tribute. God bless America ! I remember exactly where I was when I saw the plane crash into the second Twin Tower. I was only 15 at the time, in one of my history classes at my high school. People were running down the hallway crying, and I just was in complete shock. Throughout all that has happened to America as a whole, I feel we have all grown for the better. I personally want to thank you for the beautiful tribute you have put together. It truly helps to depict our true angels that will forever be watching over us. God Bless you, and thanks again for the beautiful healing touch you added to my life. Our hearts are broken forever. A friend that I haven't seen in years was killed that day. His name is Dennis Cross he was Batillion Chief in the Bedford Styvastant area of Brooklyn. His body wasn't recovered for a week. His poor family must have gone through hell. I went to school with his wife JoAnn Doria Cross. Originally from Queens Village, Hollis area in New York. We went to Martin Van Buren High School together in the 60's. We used to sing together! Thank you for the beautiful song, they are all Heroes. ~ Grace, Pompano Beach, Fl. This is a WONDERFUL TRIBUTE!!! Little did some of those know, that when their loved one left for work that morning they wouldn't RETURN. :( Just goes to show you it can happened to anyone at anytime. So while your loved ones are STILL HERE, let them know how much they mean to you and how much you love them. My HEART goes out to ALL the victims and the victims families. may God comfort you all, and may you find peace once again. (((HUGZ))) This *Little did she know song* touched my soul and made me cry. They were *TRULY OUR HEROES* God Bless us ALL and God Bless the USA!!! I send my Luv and prayers to you ALL! ~ Carol Sue (Estes) Torres, Washington State. How humbling yet so undeniably moving to see the wonderful tribute put together by you, I am from Australia as well and would have to say we shared your sorrow and heartbreak only to have so many of our young and not so young people taken so savagely and cruelly from us in the Bali incident...the swines knew where to hit us right where our kids go to play...gentle and beautiful unspolied Bali, never to be the same again. 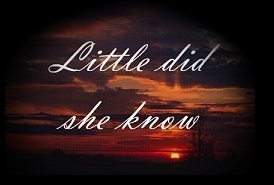 thank you so much this tribute is worthy of such praise...Kez from downunder..
"Fallen Heroes/Little Did She Know She'd Kissed A Hero"
Note*: Regarding "Little Did She Know She'd Kissed A Hero" song: We are not able to offer a sample clip or let you hear the song "Little Did She Know She'd Kissed A Hero" performed by Sandy Soffe, on this website any longer. Even though we had permission in the year 2001 & 2002 for the performance of this song with the video and sample clip, the writer has decided not to grant permission for Sandy Soffe's version of this song for the year 2003. We have complied and removed the song from the video, and the sample of the song on this website. If you remember this version, it is still available on CD with a special download of the video only. If you are a radio station and would like a demo cd for airing we would be happy to send you one. Thank you for all your kind support of this tribute.